Baptisms are celebrated every Sunday at 1:15 pm, except the first Sunday of the month. Please call the Parish Office to make arrangements in advance. New or expectant parents are required to attend a Baptism Preparation class before their child is baptized. The specific instructions on the Sacrament of Baptism are reviewed by the presiding staff member, as well as the history and value of baptism. 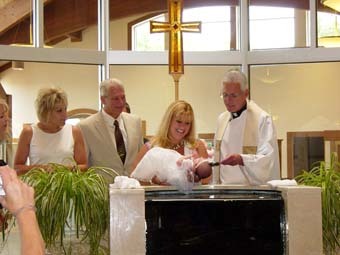 At each Baptism Class “current” parents share how they bring faith into their family life. Their focus is to provide practical tips, advice and know-how on the day to day realities of raising young children as Catholic Christians. Daily prayer, religious items in the home, communication within marriage, living out the faith beyond Sunday Mass, spending quality time with their children, showing them unconditional love and being good examples are topics that are covered.